The EMMC Roadmap for Materials Modelling is calling for a number of actions to increase the application and impact of materials modelling in industry. In its Objectives and Vision it states that “the ultimate goal is that materials modelling and simulation will become an integral part of product life cycle management in European industry” and that “in recent years, materials modelling of nano-scale phenomena, especially that based on discrete models (electronic/atomistic/mesoscopic) has developed rapidly. However, this has not yet led to the integration of these models as part of the industrial design tool chain of materials and products.” While true in general, it turns out that world leading organisations are already implementing such integration. An example of a company that seems to be well ahead of the curve is Boeing. In fact, this blog was triggered by a panel discussion that I participated in at the Predictive Materials Modelling workshop in Cambridge early December 2015. The panel on Aerospace applications was led by Airbus who presented their elaborate work on virtual testing of aircraft frames. While the work is clearly very challenging in terms of the computational resolution in FEM models required and the issues in identifying ‘hotspots’ etc., at this stage of development the materials are already well defined and no variation in material parameters are allowed or considered any more. So what about the actual materials development and its integration into this process as outlined in the vision above? Certainly Airbus competitor Boeing has been very active in the materials modelling field down to the chemistry level for some time, see for example Reference [[i],[ii]]. Rather than relying on the traditional supply chain dynamics, Boeing has become involved in chemistry based research in-silico, thereby taking a pro-active role in shaping its own future across all disciplines. Three recent Boeing patents actually demonstrate the significance of the corner-stones of exploitation of materials modelling at the industrial level which are also highlighted in the EMMC roadmap (a) materials modelling has been developed to a point that it can make an impact on real industrial problems, (b) multi-scale modelling workflows are key to realising impact, (c) it is important for business efficiency and effectiveness to integrate information gained down to the chemistry level into wider information management and business decision support systems. 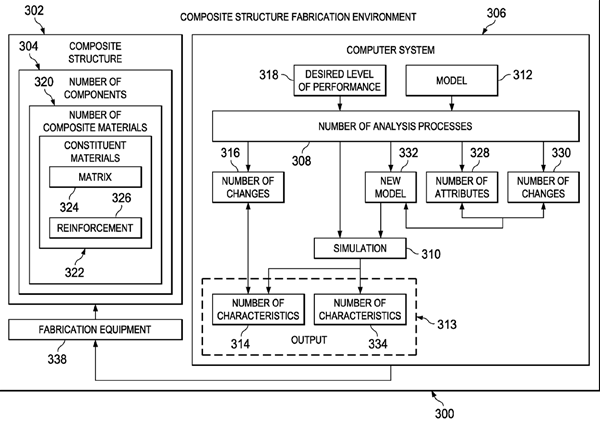 Testimony to (a) is Patent US20150080494 (Filing date: 4 Feb 2014) “Fiber-reinforced resin composites and methods of making the same”. It deals with the efficiency of load transfer between the fiber and the surrounding matrix at the micro-scale level, which may directly affect the overall mechanical performance of the composite at the continuum level. “The region of the matrix that may be substantially affected by the presence of fibers, sometimes referred to as the “interphase” region, is the interfacial area of the matrix directly surrounding the fiber. In composites, this interphase region may experience high shear strain due to the mismatch in elastic stiffness between the fibers and the surrounding matrix. Widely-used conventional bulk resins may not provide desirable distortional capabilities.” The patent claims superior performance of resins developed with the help of atomistic materials modelling. This performance improvement could translate into substantial efficiency in load bearing and associated lower weight of the aircraft frame. These patents are a clear recognition of the relevance and importance materials modelling and a more integrated approach to engineering. The question remains however how to tear down barriers preventing its wider exploitation across the whole community. That is what the EMMC Roadmap, current and forthcoming Horizon2020 actions aim to address. [i] A. Browning, “Utilization of Molecular Simulations in Aerospace Materials: Simulation of Thermoset Resin/Graphite Interactions,” Proceedings of AIChE Fall Annual Meeting, 2009. [ii] Knox, C. K., Andzelm, J. W., Lenhart, J. L., Browning, A. R., & Christensen, S. (2010, December). High strain rate mechanical behavior of epoxy networks from molecular dynamics simulations. In Proc of 27th army science conf, Orlando, FL, GP-09.